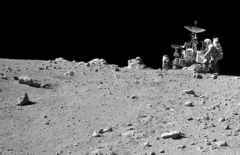 The scientific feast continued with Apollo 16, launched on 14 April 1972 to explore what were believed to be 'highland volcanics' within the rugged hills near the crater Descartes towards the centre of the Moon's disk. 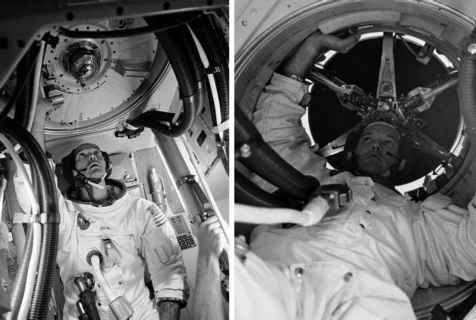 Its crew of John Young, Charlie Duke and Ken Mattingly nearly had to abort their mission some hours before landing, when the main engine on board the CSM Casper began to wobble when Mattingly tried to test its back up steering system preparatory to a scheduled burn. Once this glitch had been overcome, Young and Duke made a successful landing six hours late in their LM Orion. After a night's sleep, they stepped onto the surface, immediately prepared their rover, and set up their ALSEP science station. Although Duke had no difficulty drilling into the surface for the heat-flow experiment, Young tripped over its cable, ripping it from its connector and disabling the instrument. Their first traverse was a short one to craters where they only found breccia or 'instant rock', made in the high-energy environment of an impact event as fragments were bound together by the melting of powdered rock. Their second and third days also concentrated on traverses looking for signs of the expected volcanism, but none was found - only beat-up rocks of a vast ejecta blanket. In orbit, Mattingly continued the same type of observations that Apollo 15 had made, but over a largely different swathe of terrain. Charlie Duke works at the lunar rover during Apollo 16.
impinged on the quantity and quality of its results. It was an example of classic scientific research. A hypothesis had been proposed by geologists to explain the origin of light-toned plains that were visible across some areas of the lunar highlands. Part of Apollo 16's brief was to test this hypothesis, and with samples and observations to hand, the theories were proved wrong. This is how scientific progress is made, because it led to a new hypothesis and a better understanding of the Moon's evolution as a planetary body.